Join us at Pollyanna 圖書館 Library on Saturday, June 23 for a screening of Deanna Bowen’s sum of the parts: what can be named, followed by a conversation with the artist. This event is organized by 221A Fellow Jenn Jackson, as part of her curatorial project sum of the parts. Deanna Bowen’s 20 minute colour video work sum of the parts: what can be named (2010), is a recorded oral performance that recounts the journey of the Bowen family from its earliest documented history in Clinton, Jones County, Georgia in 1815, as told by Bowen herself. I don’t know their parents names. I don’t know if they had siblings. I don’t know when they died. I do know that my great, great, great, grandfather was born somewhere in Africa and my great, great, great, grandmother was born in the state of Georgia. As she says the words “Africa” and “Georgia” they appear on the screen in white cursive script mirroring her speech. She continues to speak the names of each known generation. Africa and Georgia are the only place names that appear on the screen, family members names appear intermittently as she moves through time. The script is populated in relation to historic markers, such as Eli Whitney’s patent of the cotton gin; the number of slaves and free blacks registered in the United States of America in 1850; the year that British Columbia joined the confederation; when Martin Luther King was shot; Apollo 11 landing on the moon; among others. As the work chronicles the lives of Bowen’s family members by retracing, reclaiming and reactivating a record of their history, it assembles multiple dimensions of the archive, where reading and looking become a political act. In the absence of official record sum of the parts: what can be named resourcefully occupies narrative strategies both within and beyond the archive. Expanding what is historically unique about Bowen’s family history and as an artwork itself coming dangerously close to occupying the status of the document. Following the screening of sum of the parts: what can be named, (2010), artist Deanna Bowen will present an artist’s talk. The Capilano Review’s Winter 2018 issue The Work of Words features a conversation between the Artist, Cecily Nicholson, and guest-editors Emmanuelle Andrews and Katrina Sellinger, will be available for purchase at the event. Deanna Bowen (b. 1969, Oakland; lives in Toronto) is a descendant of the Alabama and Kentucky born Black Prairie pioneers of Amber Valley and Campsie, Alberta. Bowen’s family history has been the central pivot of her auto-ethnographic interdisciplinary works since the early 1990s. Her broader artistic/educational practice examines history, historical writing and the ways in which artistic and technological advancements impact individual and collective authorship. 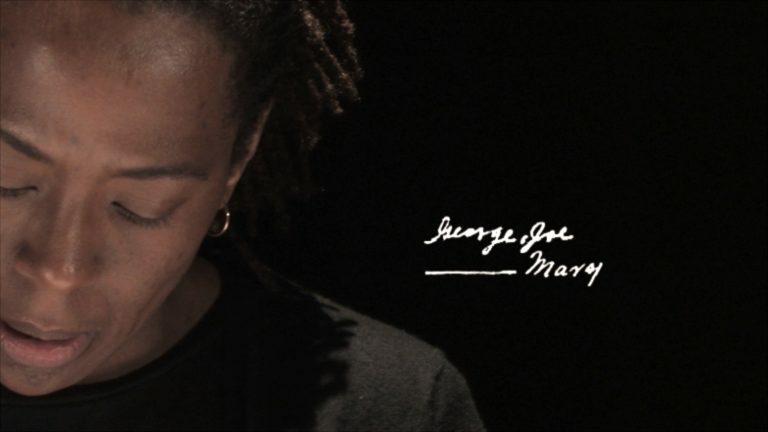 She has received several awards in support of her artistic practice including a 2016 Guggenheim Fellowship and the 2014 William H. Johnson Prize. Her work has been exhibited internationally in numerous film festivals and museums, including the Institute of Contemporary Art at the University of Pennsylvania, the Images Festival, Flux Projects, the Kassel Documentary Film and Video Festival, the Nasher Museum of Art at Duke University, and the Canadian Museum of Immigration at Pier 21, Halifax.